Students sit atop a plinth in the corner of Lobby 7 as pedestrians walk past on Nov. 5, 2009. The Class of 1954 is sponsoring a student contest for designs to sit atop the pedestals, which were left unfinished after Lobby 7 was designed in 1939. 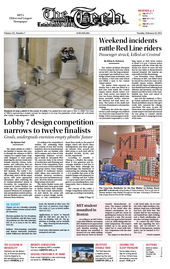 The empty plinths in Lobby 7 are familiar to anyone who passes through the entrance to MIT’s campus on a regular basis. Originally designed to hold statues depicting the ancient Greek intellectuals Aristotle, Ictinus, Archimedes, and Callicrates, they are commonly adorned today with a rather unique piece of artwork: MIT students. The Lobby 7 Design Competition, which kicked off last May, aims to fill the empty spaces with more appropriate adornment. After reviewing the 60 student-submitted entries in December, the competition announced its twelve finalists two weeks ago. The competition has separate divisions for undergraduate and graduate student entries, and the finalists were evenly split between these divisions. Two violent incidents disrupted T service along the Red Line, which serves MIT, over the long weekend. A passenger was stabbed on a Cambridge-bound train on Monday, and on Sunday, a Red Line train struck and killed a man at the Central Square station. WASHINGTON — Among the thousands of demonstrators who jammed the Wisconsin State Capitol grounds this weekend was a well-financed advocate from Washington who was there to voice praise for cutting state spending by slashing union benefits and bargaining rights. BRUSSELS — At the annual World Economic Forum in Davos, Switzerland, the hottest ticket in recent years has invariably been an invitation to Google’s lavish private party, and 2011 was no exception.